1. The following table gives information about fishing pattern, mean weight at age (g), natural mortality and proportion mature by age. Compute the yield per recruit and spawning stock biomass per recruit assuming the fishing mortality rate to be F=0.3 on average on 5-7 year old fish. 2. The relationship between spawning stock size and recruitment for a certain fish stock has been estimated to be of the form . In this equation it is assumed that the spawning stock biomass is in tonnes and the recruitment is in millions of individuals. In addition it has been found that at F=0.1 the spawning stock biomass per recruit becomes 2 kg and the yield perrecruit becomes 1 kg. Compute the expected long-term yield from the stock at F=0.1 if =3 and =500000. 3. The following table gives the population abundance in numbers by age in the beginning of the year 1980. It is belived that fishing mortality on 4-7 year old fish was 0.4 and a recruitment prediction estimates recruitment in 1981 at 700 million individuals. Use data on mean weight at age, natural mortality and selection from the table in question 1. (a) Predict stock size in numbers by age in the beginning of 1981. (b) Predict the catches in tonnes in 1981 corresponding to the same fishing mortality rate. 4. 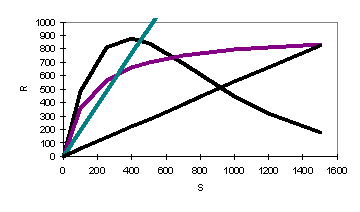 The following figure shows examples of Ricker and Beverton-Holt curves which descibe possible relationships between a spawning stock biomass and recruitment. 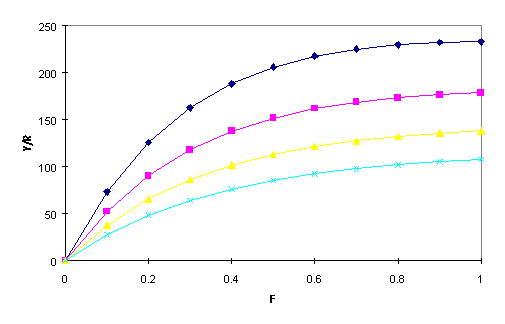 Also shown are replacement lines corresponding to a moratorium as well as F=0.6. (a) What will be the long-term development of the stock under fishing with F=0.6 and the Ricker relationship holds true ? (b) What if a moratorium is in place and the Beverton-Holt curve is valid ? 5. The following figure shows the yield per recruit (Y/R) based on different assumptions on natural mortality (M=0, 0.2, 0.4, 0.6). Total mortality has been estimated using catch curve analysis as Z=0.8. (a) What is the yield per recruit corresponding to present fishing mortality for each assumption of M? (b) Will the equilibrium catch at current the fishing rate be as sensitive to the assumption on M? 6. 6. The Ricker relationship between spawning stock biomass and recruitment holds for a certain stock. Fmax has been used as a reference for management advice since Fmax describes the fishing mortality rate which give the maximum yield per recruit. This reference will now be replaced by FMSY, which gives the fishing mortality rate providing the maximum sustainable yield. Is it possible to infer which number is larger, Fmax or FMSY ? (Hint: Consider this question with a replacement line in the S-R plane in mind. Start with a line corresponding to Fmax and then investigate what the effect will be on yield per recruit, recruitment and total yield to increase or decrease the fishing mortality rate corresponding to specified Ricker curves. Remember to justify the answer). 7. The relationship between spawning stock biomass (S) and recruitment (R) for another stock, is given by R=[alpha]S[beta] where the coefficients [alpha] and [beta] are specified numbers satisfying [alpha]>0 and 0<[beta]<1. The selection pattern, mean weight at age and maturity at age are known so that it is possible to compute the yield per recruit (Y/R) and spawning stock biomass per recruit (S/R) for a specified fishing mortality, F.
Write down the equation(s) describing long-term yield (Y) on the basis of quantities given above.